It’s not only because we are the ORIGINAL Spinal-Air Lumbar Traction Brace – with 4 U.S. and 2 utility patents. At Disc Disease Solutions, we focus all of our time and energy on one thing and one thing only – creating the best possible, intelligently-designed Decompression Belt. Decompression Bracing is our ONLY focus. Our Lumbar Decompression Belt is the ONLY Brace on the market that has an integrated natural curve engineered into the Brace. The natural curvature of our Brace allows it to easily conform to the natural curvature of your spine making our Brace comfortable and more effective than the competition. This curve targets the L5 in particular because of the natural vulnerability of this section of the lumbar spine. Would you rather have a Decompression Belt that fits, conforms and feels natural to your body and your body’s movements or one that’s flat and rides up and down as you sit and walk? 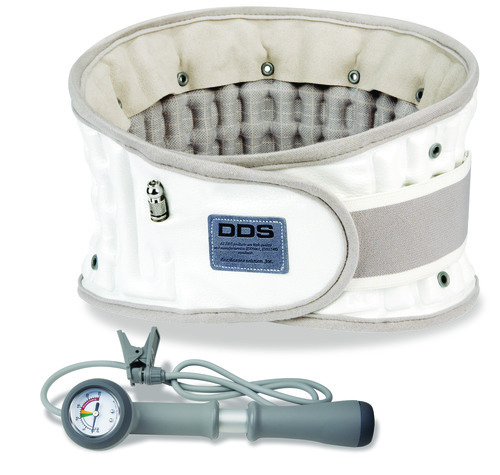 Our Decompression Belt is available in 10 different sizes. Other competing brands only offer 2 sizes. 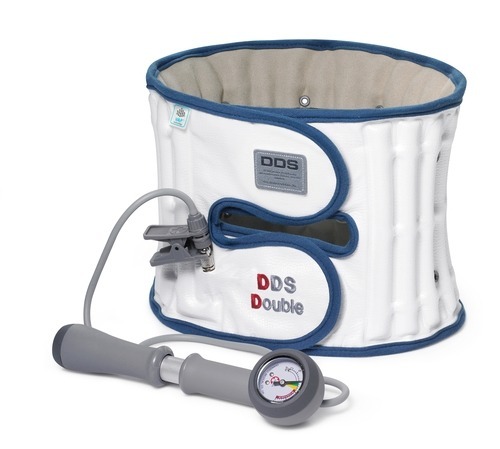 While producing a product in the least amount of sizes can be cost effective for the manufacturer, in order for the brace to function the way it was designed to, the air chambers must cover at least 80% of the circumference of the torso. When this surface area is not met the effectiveness of the brace drastically decreases by up to 30%. It’s simply impossible to cover everyone’s torso with only 2 sizes. We, on the other hand, believe in accuracy and doing what is best for the patient without having to compromise just for the sake of being cost-effective. Our Hand-Air Pumps are easy to use, are equipped with an easy to read PSI gauge and are compact. Other brands use a foot pump. It’s difficult enough to keep the foot pump balanced so that it does not inadvertently flip over, but how could one possibly expect someone with sciatica or excruciating back pain to use their leg to pump something? These competing brands are not even equipped with a pressure gauge. With our Hand-Air pump you can clearly see how much pressure is being applied at all times. Lastly, our Decompression Belt has a 100% soft cotton lining and is machine washable. How many of these competing braces are machine washable? None. As you can see our Decompression Belt is the most effective, well thought-out brace on the market. It is the Brace that started the lumbar decompression brace revolution. We have testimonials from patients and medical professionals alike. We also have MRI’s and medical documents to support the efficacy of our products. We challenge you to conduct a side-by-side comparison.